I was using VBox 4.3.9. Then VBox could not start. I uninstalled 4.3.14 and reboot OS. I reinstalled 4.3.9, but VBox could not start. So I did "System Restore". Well, my reproducible problem with the most recent version (4.3.14-95030-Win) is techically not exactly the same, but very similar, because i'm using an XP SP3 (x86) system as a host and sometimes, i'm unable to start the GUI interface with the shortcut, placed - by the installer - on the desktop. I know it sounds weird enough, but in fact, in those cases, it usually starts at the third ot even fourth attempt. 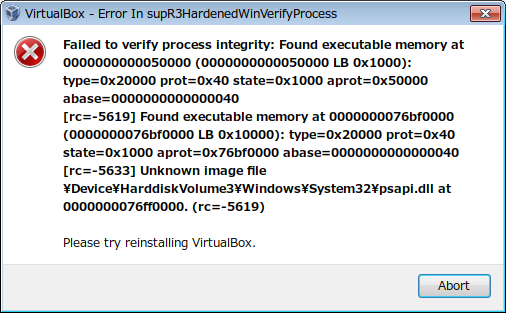 Note: Never experienced such a problem with earlier versions of VB, only with this one and right after the update. I had the problem with version 4.3.14 on windows 7, I downgraded it to version 3.2.12 and it works.